This biker is not going anywhere – SBS Australia. 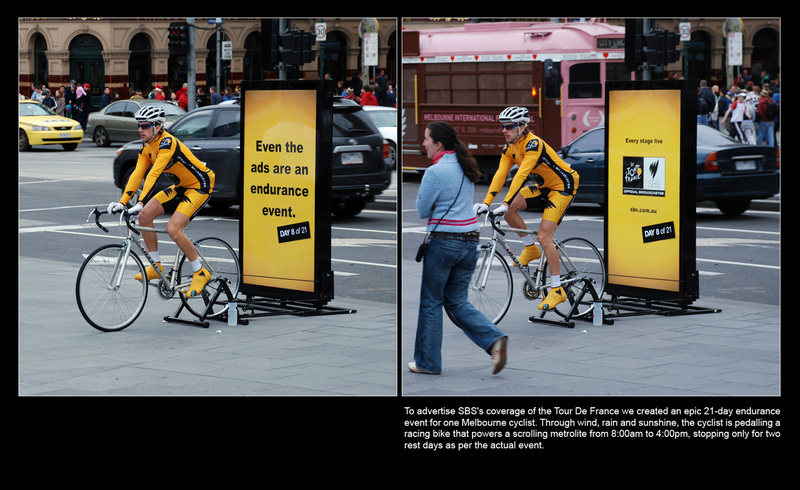 Even the ads are an endurance event – very good slogan if we believe in the link between TV station and endurance. I might have had placed it in the Cons section, as I believe that every marketing action should not only focus on the promotion of specified product/event, but also brand which stands behind it. Here I do not see it. Also yellow, a good color for pointing above crowd, in this case is AFAIK not associated with the company colors. Stand design is nothing unusual – just an ordinary metrolite with a bike attached. If it was planned to distinguish itself from the metro jungle, it would be better if it would had been designed larger, maybe with let’s say few LCD’s with transmission (due to the time zones difference, it would be probably a retransmission) of the race. Only one location (again, the info…)? We do not know that, but if the biker was located all the time in one place, even if that was Melbourne’s Times Square is an obvious waste of resources. Bike is a definition of mobility, so every day (all even few times during that same day) it should be moved through a set of different popular locations. Pointless effort – why the bystander should not ask himself – what a waste of resources/time, as there is no added value to this project. It creates and leaves nothing. Socialize it, involve the people. Why not combine that single guy efforts with a charity event (always a relatively cheap way to gain publicity). Let’s say that on the final day of the race SBS makes an event on a local stadium, and pledges to do something (probably give money of theirs or sponsors) for a selected charity. They would invite people with their own bikes on the stadium ,give them distance meters, and tell that they (or sponsors) will donate a sum for every kilometer they will ride that final day on the stadium. There would be a possibility to make a larger health-related event of that. Put a kilometer meter, or some bar/scale which would present achieved distance. Not likely, not only because of the weather conditions, but also because of the niche the cycling sport is. 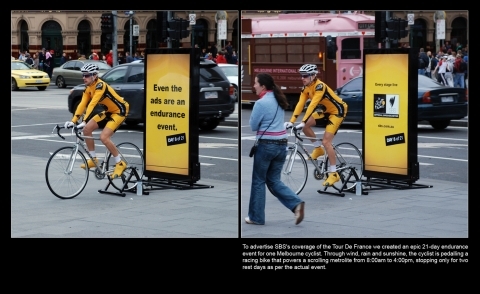 It _could_ be used together with a sort of a social/health campaign, or promoting biking as a way to spend time. 25 zapytań do bazy. Strona wygenerowana w 0.210 sekund.